Sometimes it's just too darn hot and a drink won't cut it so like all good tourists I resorted to ice-creams. This one is a bit of an indulgence on my part - I know we have these in the UK. I used to eat them all the time as a kid. Essentially it's ice-cream on a stick - a choc ice without the choc. Frigo Pie translates as Frozen Foot, but I think they are called Funny Feet in the UK. All the foot-print including individual toes are represented and the strawberry ice-cream is as unpretentious and refreshing as I remember. This is only one step up from a mini-milk in terms of price but it's a little luxury and a great one for kids and grown-ups alike. 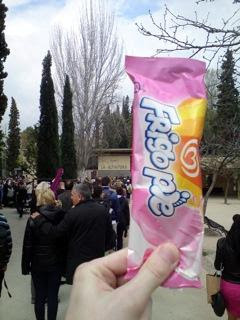 I ate mine while queuing to go into La Alhambra in Granada. This is one of the only days where my pictures feature clouds. 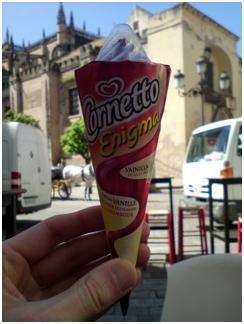 Back in Seville I spotted a kind of Cornetto I'd never seen - Cornetto Enigma. This particular one was Vanilla, Chocolate and Raspberry I think. Not only did it have the usual Cornetto features of choc on the wafer and decent ice-cream, but it had a thread of red running down the centre and lots of hard choc and mini red bits floating around in it. This is much more akin to the Magnum super deluxe range in the UK which come in their own special box. Hot countries have much better store-bought ices in the soft scoop ranges so to compete the brands have upped their game and produced things that are superior to the UK versions. While I enjoyed this it wasn't really an ideal choice for wandering around and was much more about the experience and filling up rather than cooling down. I'd happily try the rest of the range though should they decide to brave the icy, icy summers of Britain. You can get Cornetto Enigmas in the UK - at least, the supermarkets have them in Nottingham - and they're very yummy I find.